Add a little flair to your commercial patio space. With the Galtech 7.5' ft. aluminum market outdoor umbrella a one piece pole offers superior strength and durability. 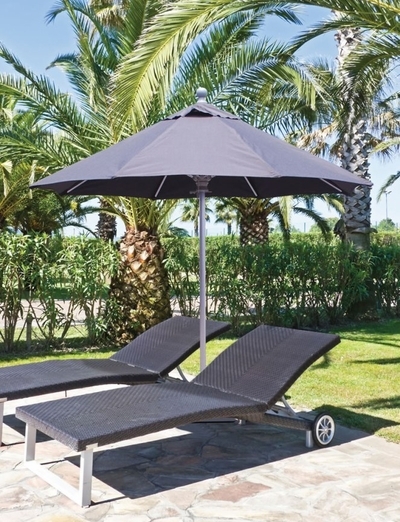 Featuring a contemporary chrome finish, this patio umbrella is sturdy enough for commercial use yet stylish enough for your own personal outdoor patio. The pole's aluminum walls are double the thickness of standard poles, making it twice as strong to endure beautifully from season to season. The umbrella opens the traditional way with a manual lift, and the 7.5' foot canopy offers sizable coverage keeping you and your guests cool all afternoon. This umbrella does not have tilting capabilities. Ideal for free-standing use or pair it with your outdoor patio tables for some relaxation time in the shade. A variety of premium fade-resistant fabrics are available and sure to coordinate with any outdoor decor. Exceptional in its styling and elite in its durability this commercial grade outdoor umbrella is sure to impress. * Shade Size: 7.5' ft.